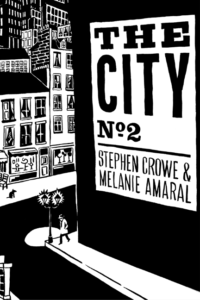 Welcome to the new website of The City, an ongoing comics series by Stephen Crowe (that’s me) and Melanie Amaral. As well as scenes from the comics, over time we plan to fill this site with a lot of miscellaneous material from the world of the comic. The most important change that anyone who’s been here before might notice is that it’s no longer presented as a webcomic, and every page is no longer archived here. You can still read everything from volumes one and two for free if you want, though. PDFs of both volumes are available for download for whatever you want to pay. When we first started working on this project, the webcomic model was a good way to motivate us to get pages done, or to try to, every week. However, we were never able to maintain a consistent schedule, and while completing the latest volume for print, we realized that the quality of the work was much higher when we gave ourselves more realistic deadlines. So from now on, we’re going to be focusing on producing one good printed volume of comics every year, although we’ll still post the occasional scenes, and maybe even process stuff and other miscellany as we work.